Vellai Appam is part and parcel of our Diwali celebrations. I grew up eating vellai-appam for breakfast during Deepavali. So after Ganga-Snanam (the ritual oil bath), we have the legiam and then this vellai appam for breakfast. This vellai-appam as a Diwali breakfast is a norm at my parent’s place but not at in-laws. But I love vellai appam, and I cannot imagine Diwali without that. 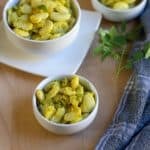 So I started making it regularly at our household as well. Guess what, vaandu loves it so much and once in a while I make it on non-festival days as our breakfast or evening tiffin. 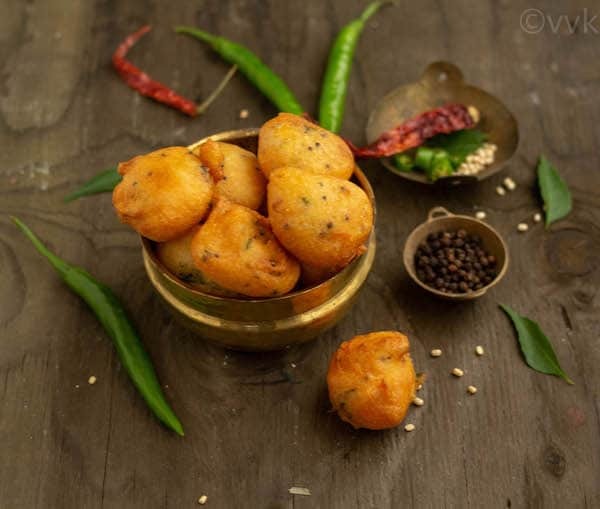 It is more like more like idli batter pakoras or unukku as we say in our household but the batter proportion and ingredients are slightly different. As we are making this as an offering on festival day, we usually make the batter with raw rice and not with boiled or parboiled rice. The ratio of raw rice to urad dal is 1:1. As always we don’t add any onion or garlic. 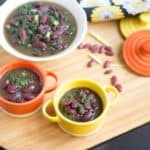 The black peppercorns and ginger add a unique flavor, and you won’t miss onions for sure. Usually, we prepare the batter the day before Diwali so that we can make the appams the next day for breakfast. 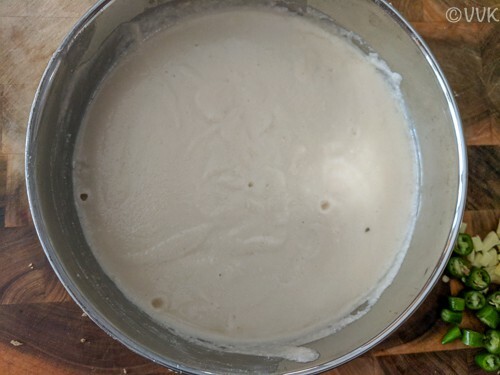 Making the batter well-ahead allows ample time for fermentation. We do the tempering before frying. But you don’t need to ferment this batter. It is not mandatory, but I would recommend letting the batter to sit for at least two hours. But if time is pressing, then you can make the appams right away. If you prefer the sour taste, then allow the batter to ferment or add a tbsp of sour yogurt to the rice mixture. 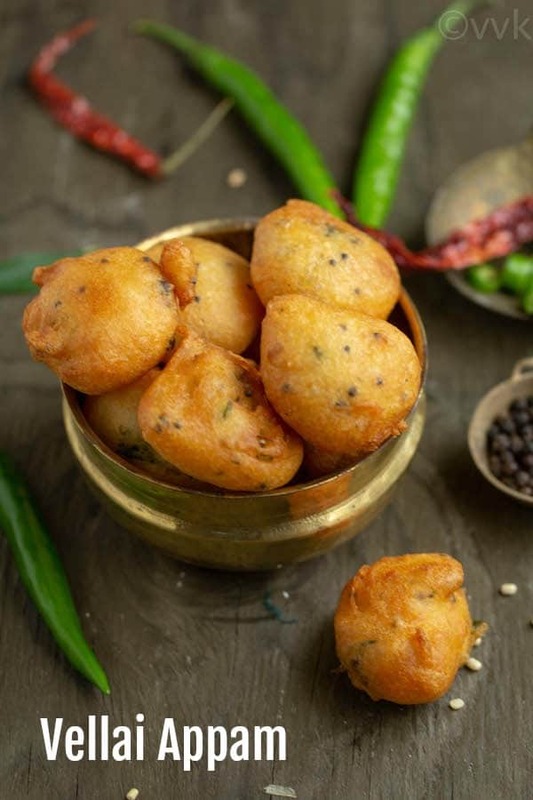 This vellai-appam is quite popular in Chettinadu cuisine and also in and around the Madurai and Tirunelveli area. I recently read that this vellai appam or the tasty uppu appam is prepared during Karthigai festival as well. Without any further ado, here is the vellai-appam recipe handed down by my mom. 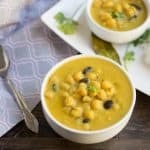 Soak rice and urad dal separately for 3 to 4 hours. 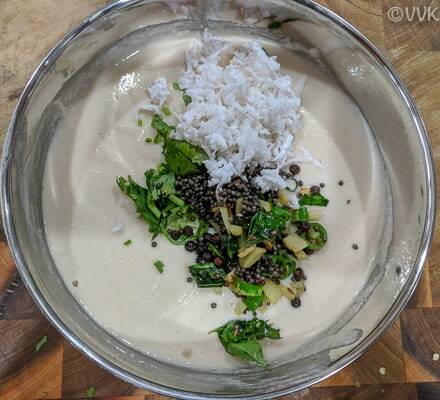 Grind the dal and rice smoothly by adding water. 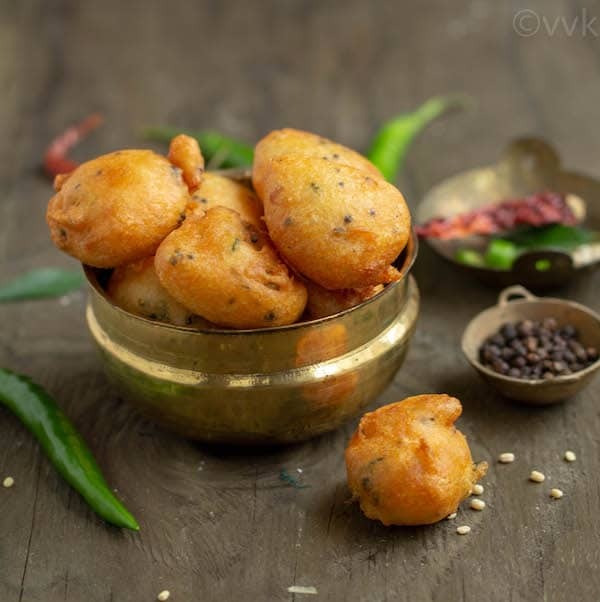 The batter should be thick like urad dal vada batter. Chop the green chilies and ginger finely. Heat 2 tsp oil for tempering. 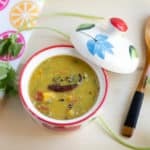 When the oil is hot, add the mustard seeds, pepper, green chilies, curry leaves, and ginger. When the mustard seeds start to splutter, then add this tempering to the batter. 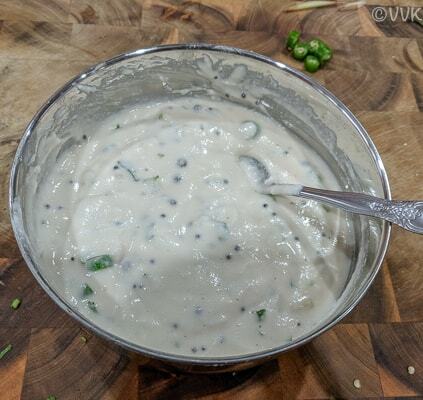 Also, add the grated coconut and cilantro if using to the batter and mix well. The vellai appam batter is now ready. Use a deep rounded spatula or spoon and scoop out the batter and pour it carefully in the oil. Fry it over medium flame until the appam turns golden brown. I usually fry two to three vellai appams in one batch. Drain it on a tissue paper to remove the excess oil. 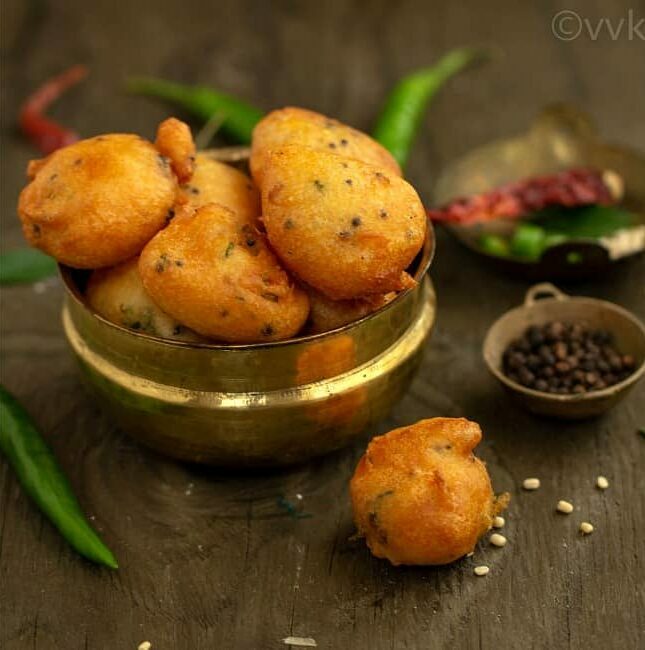 Similarly, make /Fry vellai appams with the remaining batter. That’s it vellai appam is ready. 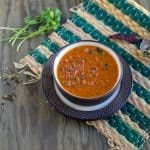 Serve this hot with your favorite chutney. Black pepper adds a unique flavor so try not to skip. Adjust the green chilies, ginger, and salt according to your preference. If time is pressing and if you are not able to ferment the batter then add approximately 1 tbsp of sour yogurt and make these appams. 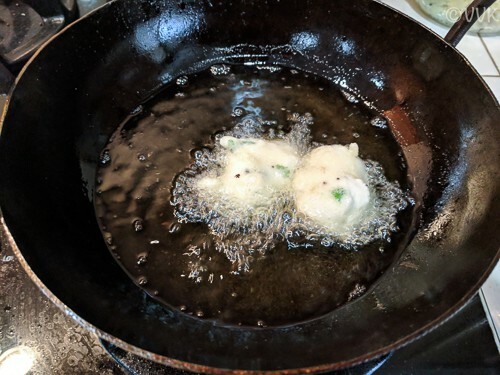 Always fry over medium heat and do not crowd the frying pan with too many appams. Fry three to four at the maximum. 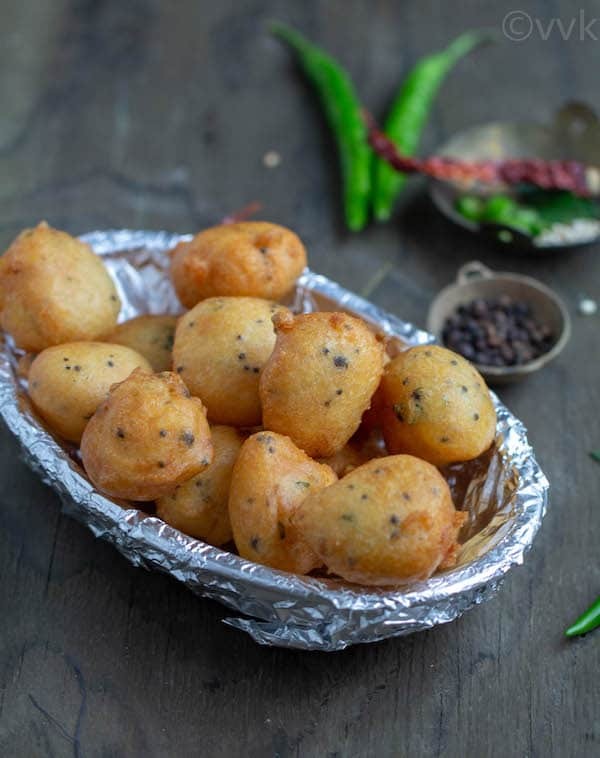 Vellai Appam - A crispy and a savory deep-fried breakfast delicacy made during the festivals, especially Diwali. That's it vellai appam is ready. Black pepper adds a unique flavor so try not to skip. Adjust the green chilies, ginger, and salt according to your preference. Can I make it in appam pan?